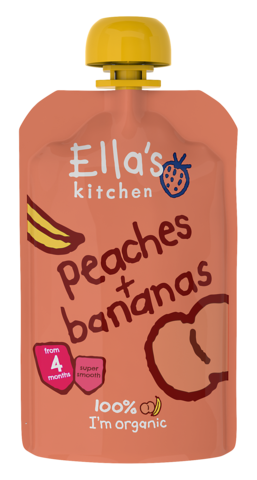 Hello, I'm 100% organic pureed peaches, bananas + a dash of lemon juice - with nothing else added, not even water. Who am I for? My ingredients are suitable from 4 months. I'm also great mixed into fruit, veg or porridge for babies and toddlers ready for more texture. The Government advises that you don't need to wean your little one until they are 6 months. Every baby is different! Values per 100g : Energy 265kJ/63kcal, Fat <0.5g, of which saturates <0.1g, Carbohydrate 13.9g, of which sugars 13.2g, Fibre 1.3g, Protein 0.9g, Salt 0.03g. Squeeze me into a bowl or straight onto a spoon. To warm me, stand me in hot water + check I'm not too hot. Never put my pouch in the microwave. My cap could be a choking hazard to children under 36 months. Please always keep out of their reach. If I am damaged or look inflated with air, do not feed me to your baby and return the damaged pouch to us.